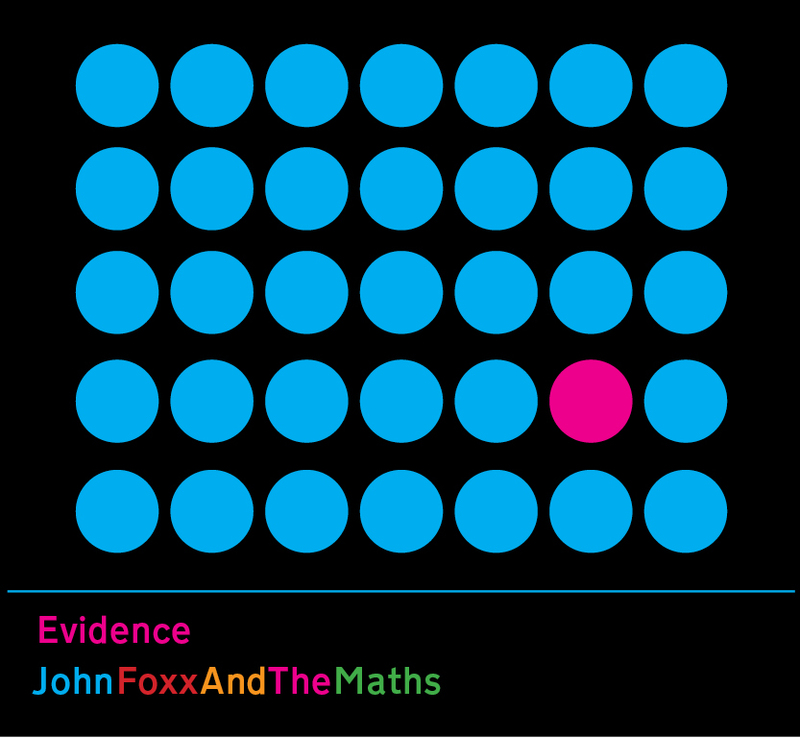 Initially planned as an EP Evidence grew into an album as it became clear that a certain mood and style was emerging from The Maths studio in London – darkly percussive and full of troubled characters and strange, atmospheric twists. The edgy beats of the opening track ‘Personal Magnetism’ are followed by an extended version of ‘Evidence’ featuring The Soft Moon’s Luis Vasquez. There’s a sense of being disrupted and confused, as whole new layers of sound whirl around Foxx’s brooding, psychedelic vocals. The minimalist electro-pop of ‘That Sudden Switch’ was inspired by a Xeno & Oaklander riff, while ‘Talk (Beneath Your Dreams) features US electronic artist Matthew Dear taking the role of ‘the sleeper’ as a conversation is held in a dream. It’s a stark, nightmarish track but like much of this album, it has motion – Dear adding new techno rhythms to this version. ‘Neon Vertigo’ furthers the noir atmosphere with massive bass and some ‘space violin’ from Maths regular Hannah Peel, while ‘Changelings’ is in many ways the centre of the album. Written and recorded by new Maths collaborator Gazelle Twin, ‘Changelings’ only retains the vocals of the original as The Maths rebuild it completely from scratch. It’s arguably one of Benge’s finest moments in the studio so far while Foxx’s vocals are re-purposed from Cathedral Oceans to complete this beautiful end-of-the-world song. What follows is weirder still: ‘My Town’ features Peel again on violin while Foxx’s distorted voice dominates as an ego-on-the-brink-of-madness. The cover of Pink Floyd's ‘Have A Cigar’ starts with a cackle of laughter before Foxx launches into another heavily treated vocal as the singer goes ‘corporate’ – sounding just as warped and dangerous as the self-appointed master of the previous track. From record execs to bankers, some things never change . . . ‘A Falling Star’ is a reverse of ‘Changelings’ – a Foxx/Benge track reworked by Gazelle Twin. In this context, it becomes a coldly glamorous ballad full of siren vocals and a sense of release as it stretches into the long, elegant fadeout. In fact, it does signal a change, as the mood gradually evolves into something more reflective. The two instrumentals ‘Cloud Choreography’ and ‘Shadow Memory’ offer some new space and textures, while ‘Walk’ appears to emerge half-way through a dream as Foxx sings ‘and I walked through all the streets of this city’ after a slow build. This is glowing, rich, analogue music which climaxes with the electronic harp music of ‘Myriads’ and the final song, ‘Only Lovers Left Alive’ – a pretty melody found on an old discarded reel-to-reel; nostalgic, the sound of memory and tape creating one of the album’s most moving tracks. Meanwhile, the sci-fi imagery of Jonathan Barnbrook's booklet design is colder and more ambiguous in tone than his previous work for The Maths. There's a sense of mystery to the product, as well as to the music.